North Wind Team began it's 2014 show season by attending the two UPHA Chapter shows in our region; first was the Children's Benefit Horse Show for our home chapter which was followed by Chapter 14's Spring Premiere Horse Show held at the Big E Fairgrounds in West Springfield, MA. The weather somewhat chilly at both events was typical for this time of the year, but it didn't keep our new and proven show teams from hitting the show ring. We thank Ann Scussell and Eleanor Hutcheson for once again putting together a great show for Children's Benefit at the Dream Park and Kent Moeller with Linda Burke with her office staff from their new digs at the show office which made our stay at the Big E easy. On a combined basis we brought 42 horses to these shows which went without a hitch thanks to our experienced staff and training team. We also appreciated the help from some of our show team to make sure that all the tack was in order. On between these shows we even found the time to go to Jimmy Robertson's sale in Shelbyville, KY.
Every now and then a show team's profile changes and this year is no exception at North Wind. With a lot of hard work at home we are excited to bring out over 10 new prospects and junior horses along with some new teams for new divisions. All of these younger horses are owned by several of our seasoned customers who have been long term participants in horse show industry. Many of these horses were seen at these two shows and a few are yet to be brought out to the show ring. We also thank our returning amateur competitors as well as the North Star Academy team under the direction of Erin McCracken. They already have their sights set on the national finals in Murfreesboro, TN in early November. Some of the highlights from these events were the 3 year old Fox Grape's Trinity Road who won the Prospect Classes at Children's and the UPHA Park Pleasure class at Spirng Premiere (see above). Another young horse hitting the show ring for the first time is Dr. Meanor's Nuttin But Steel colt out of her mare CH Steel In Love shown below..
Pat Johnson and her Charming In Blue gelding won both Grand Championship Western Pleasure classes at these events. Mary Elias and her Happy Seventy Fifth won the Shatner Western qualifier that earns her a trip to the finals in Missouri this September. Western prospect King Cat won the Western Open Pleasure class with Jason Molback for Kathy Kerr of Sebastian, FL. Another successful team in a new division were Jennifer Reynolds with her mare Royal Crest's Let It Be Stone who we expect will be a strong contender in the Hunter Pleasure Division. Erin McCracken won the Park Pleasure championship at Childrens's with CH Gone Platinum. jason Molback and CH Five O'Clock won five gaited open classes at both shows bringing home the blues for Dr. Meanor. Look for Jason to come out with a new team later this season for Dr. Meanor. Joan Booth riding Winsdown Baccarat for Joelle Bennett won the adult Country Pleasure Championship at Children's Benefit and Dr. Meanor was a reserve champion in the division's qualifier with her CH Prince of the Day. For North Wind and Nealia one of the highlights to the shows was the return of CH The King's Talent (aka Orlando) to the show ring with Kayla Frumolt in the walk trot Academy classes. Orlando has been in retirement for a few years with what we were told was a career ending condition. Over the last year or so with only light exercise he appeared better to where our vet said he could be shown lightly. Kayla was a good partner for Orlando and both were successful in their classes at Children's Benefit. This year's convention in Lexington, KY included a presentation at the Awards Luncheon and Annual Meeting that outlined a new marketing approach for the breed. Marketing executive Allen Bosworth presented on behalf of the association a fresh look at the American Saddlebred with a updated logo, tag line, "the American Spirited Beauty" the and following video. This video is just a first of a series of new videos that are planned to promote the breed. Under the direction of Nealia McCracken and Jason Molback the North Wind Show Team wins the Jr. Shatner Finals with Theresa Scott in the saddle. When North Wind was located in Illinois the barn was in the winners circle several times over in the Shatner Western Finals and Hunt Seat Finals at St. Louis. Jason himself as a junior exhibitor was reserve western champion more than once. Given family issues Marge had not been able to show her horse for several years. Nealia had to find catch riders for Monti to keep him in the ring. Her rider of choice was her daughter Jessica until she turned professional. After that Nealia turned primarily to Theresa Scott and Pat Johnson. Theresa became a good team with Monti and she said that he was one of her favorite all time horses. In the last couple years Monti carried no less than 5 different riders each year to the show ring, but this time around it was Theresa with the blue ribbon. North Wind Stables posts Press Release regarding Erin's decision to declare her professional status. Erin had been helping out Saddlebred Rescue Inc in her free time after the departure of Ann Butler in late 2012. The rescue went through a formal process to seek a replacement for Ann and after a few months decided they had their candidate all along. Erin accepted the position as assistant trainer for the rescue working under Nealia's direction. She also accepted a co-role as Instructor and Academy Director at North Wind. Local Warren County horsewoman, Nealia McCracken of North Wind Stables in Hardwick, NJ accepted the Shirley Parkinson Professional Achievement Award at the 2012 UPHA National Convention held January 5-7 in Nashville, TN. McCracken was honored “for her unselfish work, outside her expertise in horsemanship, for the betterment of our organization and our industry”. 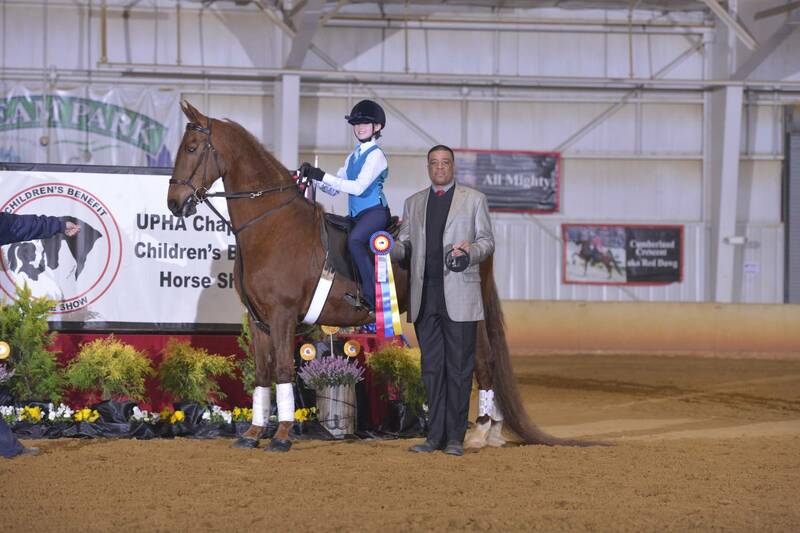 The United Professional Horseman’s Association (UPHA) is a nationwide organization comprised of equine professionals involved with the American Saddlebred, Hackney Pony and Morgan breeds. Their creed is “Horsemen Helping Horsemen” and their mandate dictates that members “work towards certain goals that help not only the individual horseperson, but also the industry as a whole”. McCracken was tapped for the award due to her 25+ year participation in the show horse industry as a trainer and instructor, her lifelong volunteer work to promote the American Saddlebred breed and in more recent years her passion and innovation in the equine rescue sector. 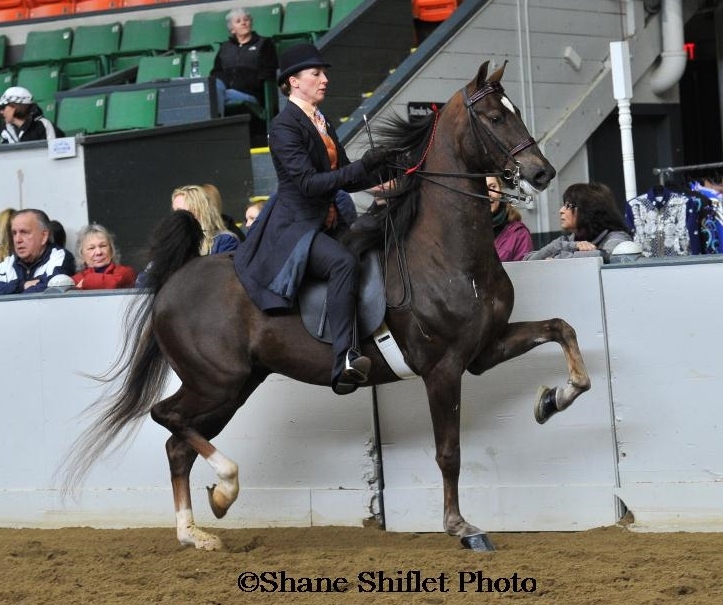 One of the founders of Saddlebred Rescue, Inc., McCracken has made it her mission to rehabilitate, re-home and return Saddlebreds to their “roots” in the lesson programs of training stables across the country, and in this way promote the breed. 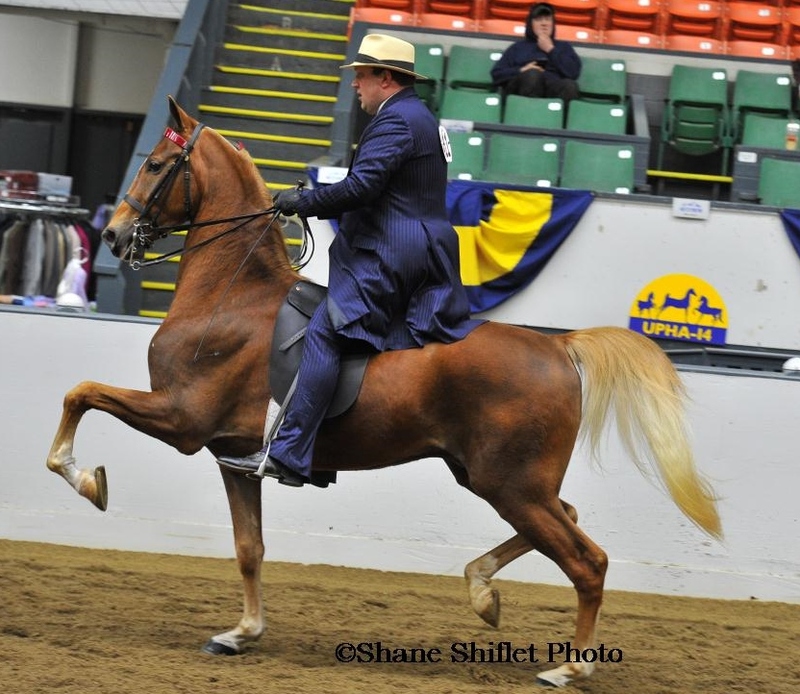 Rehabilitated rescues are also placed as personal pleasure horses and competitors in a variety of disciplines other than saddle seat. McCracken has a long history in the horse industry as owner, along with her husband Mark, of North Wind Stables, a training facility for American Saddlebred horses and their riders. She has coached horses and riders to countless national titles, across a wide range of divisions: from equitation (junior riders and adults), to Western Pleasure to the gaited performance divisions. Prior to its moving to Hardwick in 1999, North Wind Stables held a prominent position in the industry at its location outside of Chicago, IL. A business transfer for Mark McCracken necessitated the move, which turned out to be serendipitous for Nealia McCracken’s evolving career. In late 2005 McCracken went to the New Holland livestock auction in Pennsylvania to purchase two horses in need for a Youth Club project at the barn. Through this experience she discovered that these horses would make good lesson horses, a better alternative for these horses that had worked all their lives, than being sent to slaughter. 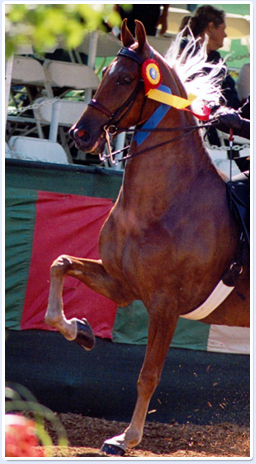 In 2006 McCracken joined forces with Christy Parker in Georgia who founded Saddlebred Rescue and soon thereafter, the physical operations part of the rescue was moved to McCracken’s horse farm in New Jersey. The proximity of North Wind Stables to Lancaster County with its large population of Saddlebreds was something that McCracken never anticipated. When these animals reach the end of their useful life as buggy horses with the Amish, they are sent to the livestock sales at New Holland, PA, where sadly, many find themselves being shipped to slaughter in Canada and Mexico. McCracken realized that these horses, although no longer able to do the relatively strenuous work of pulling buggies 30+ miles a day, were in many cases, still very usable in a variety of other capacities. Additionally, McCracken knew that many of these horses had spent their earliest years in a Saddlebred training barn and that they would have retained the memory of that early training. Animals brought into the program at Saddlebred Rescue are evaluated by a veterinarian, as well as McCracken and the one full-time employee of Saddlebred Rescue, Anne Butler, for any health or usability issues. The horses are carefully screened for their suitability as lesson or pleasure horses and then promoted via the Saddlebred Rescue website to potential adopters. McCracken and her team have placed over 500 horses in new homes since the inception of Saddlebred Rescue, building business and goodwill all along the way. You can find more information about North Wind Stables and Saddlebred Rescue on Facebook or go to their respective websites at www.northwindstables.com and www.saddlebredrescue.com . Look for the rescue’s new website to be posted soon. For more information on the upcoming episode of The Nate Berkus Show, go to www.TheNateShow.com. You can use the “Station Finder” on Nate’s website to find the time and channel to watch in your area! The show is set to air on September 28. 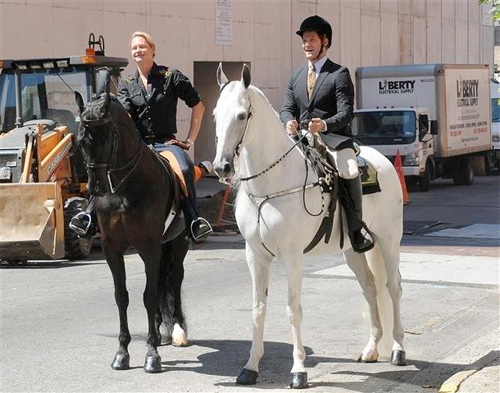 Carson Kressley had this to say of his appearance on the show: "Our American Saddlebred gained a lot of new fans the day we taped the segment for the Nate Berkus show. Nate, the crew, and the audience all fell in love with our breed. Hopefully after the show airs, millions of Americans will also be won over by their charms. We owe a debt of gratitude to Nealia and Mark and Erin McCracken and Jason Molback from Northwind Stables in Blairstown NJ for volunteering their time (the day after they returned from Louisville - AND through a hurricane no less!) bringing these great ambassadors of the breed to New York City for the taping. CH A Magic Surprise and CH Prince of the Day could not have been better examples of our breed. They were presented beautifully and their manners were extraordinary! We also need to thank their owners Pat Johnson and Dr. Geraldine Meanor for lending us their horses for what may have seemed a bit of a crazy adventure. I would encourage everyone to make a donation to Saddlebred Rescue to honor these trainers, owners and horses who offered their time, talent and horses for the overall betterment of our breed. Jessie was recently notified that she was the chosen Junior Equestrian of the Year to be awarded at a USEF banquet in mid January. Jessie is the 5th Saddlebred competitior to win this award. The following is a copy of a news story ran soon after the press release by the USEF. U.S. Equestrian Federation Junior Equestrian of the Year Jessica Moctezuma, of Hardwick, on Top Beat.There have been plenty of show ring honors recently for Jessica Moctezuma, but they pale in comparison to the trophy the Hardwick resident will accept next month for being the U.S. Equestrian Federation's Junior Equestrian of the Year. "This is the most meaningful thing I've ever accomplished," said the 18-year-old, a graduate of Pope John XXIII High School in Sparta, who learned of the honor last week. 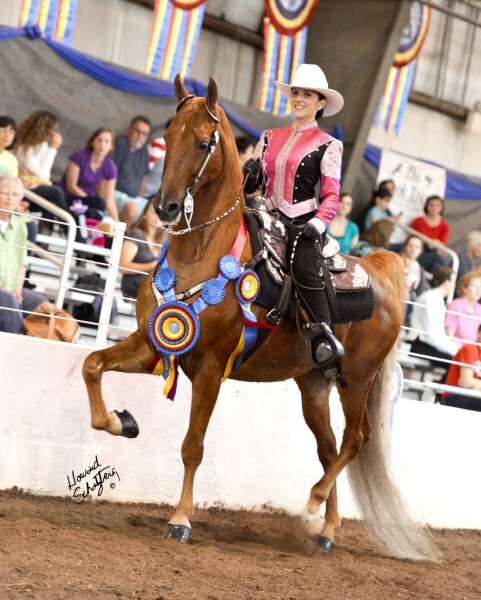 Moctezuma specializes in saddle seat riding, yet she also sits tall in a western saddle and has competed successfully in hunt seat classes as well. She was the senior equitation champion at the prestigious Lexington, Ky., Junior League Show, is a three-time Mid-Atlantic Regional Equitation Champ and a member of the five-gaited team at the World Cup in South Africa this year. While that record more than fulfills one of the qualifications for the award -- calling for candidates to have taken part in USEF shows during the year -- consideration also is given for good sportsmanship and integrity. In Moctezuma's case, her efforts outside the show ring have called attention to her desire to make a better life for horses, especially those that have been abused and neglected. She works with her mother, trainer Nealia McCracken, who founded Saddlebred Rescue with Pat Johnson. The organization also has been recognized for its accomplishments by USEF. Operating out of McCracken's North Wind Farm, the rescue takes horses that have been discarded and abused, retrains them if necessary and then finds them new, loving homes. "I feel like I've had a really good life with the saddlebreds," said McCracken, explaining her devotion to the animals. "When I found out these horses were going to slaughter, I felt like this was something we needed to do, take responsibility." She has passed that mantra along to her daughter, who began riding as a tot in the same saddle with her mother before graduating to riding on her own after just one lead-line class. Saddlebred Rescue offers work that strikes close to the heart for Moctezuma, who assists her mother in the evaluation and training part of the operation. "I imagine my horses I love so much, and us losing them and then someone finding them and rehabilitating them. I always picture my horses in that situation," said Moctezuma, explaining why she is so eager to give back and offer the animals another chance. "I've put more hard work into the rescues than anyone can believe. Not a lot of people realize how much we do for them -- and how much they do for us," said Moctezuma. "They helped me learn patience, and appreciate the things in front of you. It makes me see you never know when something is going to happen to make your whole life switch around. Some of these might have been show horses or lesson horses, and then they got sore and people took them to the sale," she continued, referring to auctions where too many horses wind up destined for slaughterhouses. Her "catch-riding" work with Saddlebred Rescue has paid off in another way, as she has learned how to develop a horse herself, rather than spending six figures for a made mount, as many others in saddle-seat equitation do. She can't afford that anyway, but has gotten so much more out of taking a talent and honing it. A case in point is Top Beat, known around the barn as Elvis. He was a five-gaited horse (saddle seat equitation horses usually come from the three-gaited ranks) who she trained as a partner for the most exacting competitions in her discipline. 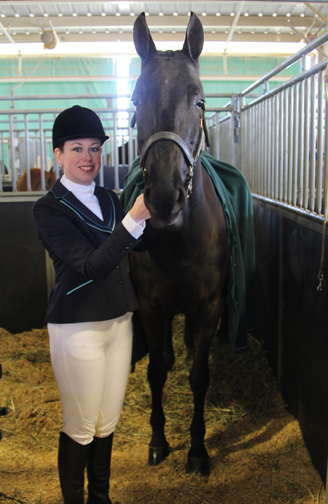 "I decided to take on the challenge," she said, a characteristic course for this rider. Moctezuma, who will study childhood development and psychology at Sussex County Community College starting next month, is quick to give credit to her support team that includes her stepfather, Mark McCracken, who met her mother when he bought a horse from her. Now he rides Frank, a draft horse who came from Saddlebred Rescue, which has more equine breed diversity among those it saves than the name would indicate. Moctezuma's father, Mayo Moctezuma, is a trainer in Illinois who helps her when she's out there, and her brother, Jason Molback, pitches in by taking photos. They're a close-knit group at North Wind, and rather unusual; saddlebred-oriented farms are rare in New Jersey, where hunt seat dominates the stables and the shows. "Not a lot of people take me seriously when I say I read saddlebreds," Moctezuma said wistfully. When she receives her trophy at the USEF annual meeting in Cincinnati, it may well give her a whole new image in her home state.